In March, April and May, Kristine Jørgensen and me – I am Torill Mortensen, working at the IT University of Copenhagen and one of the active partners in the project – had the University of Bologna as our base while working on one of the deliverables to the Games and Transgressive Aesthetics project. With the support of Veronica Innocenti and Paolo Noto at the Dippartimento delle Arti, we had the chance to visit and use their rich and beautiful libraries, including the wonderful game archive of Bologna. 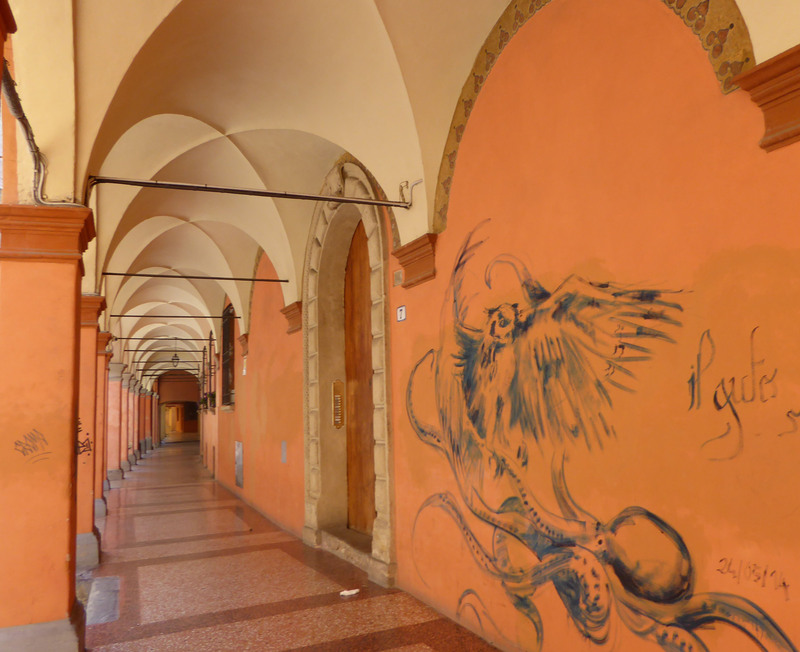 The stay was capped by the Media Mutations conference held at the University of Bologna, where we organized a pre-conference seminar. Under the title of Researching the transgressive aspects of gaming and play, we organized a one day seminar with eight different presentations and one experimental play session. For a full list of topics and participants, please see the program. The challenge of the day was to discuss different strategies for researching experiences most people prefer not to talk about, or perhaps can’t even put into words. We saw games used as tools to talk about problematic topics, were introduced to the difficulties of finding traces of play nobody wanted to reveal they were engaged in, and saw screenshots which would normally not have been safe for work, as we learned about the challenges of researching different interface modifications to popular games. The discussions were wide ranging and interesting, and if you would like to learn more about the topics, the lectures were recorded with video, and will be available on this blog. After lunch we were introduced to an old game of blasphemy, and tried to play it in a way that would be offensive. This revealed that we lacked any common standard for what was unsayable, and that culture differences blurs the line between game and context, making it a very hard game to play in a formal, work-setting even for game scholars. To conclude the topics of the day were very well connected. Since they were not part of the same exploration, there is no final conclusion to the topics discussed, beyond the need to understand transgression. Ilaria Mariani and Davide Spallazzo demonstrated how games with challenging premises can make us think about ethics and morals, Kristian Bjørkelo’s discussion of the problems of researching transgressive topics was well situated to question and enrich the methods and reigning ideas of digital ethnography, Tomasz Z. Majkowski’s presentation of mods in Skyrim was a homage to the unapologetic creativity of players, Olli Leino’s talk on the death-loop was an elegant post-mortem on ludology, as it introduced transgressive play to game structure, Jaroslav Švelch introduced us to an important history of gaming practices at the edge of the illegal, Jaakko Stenros brought us back to the player’s experience in play, and Jon Back discussed how play, including transgressive play, is connected back to the design of games. All of these topics underlined how understanding games based on an aesthetic of transgression brings a more situated and connected understanding of game design and play, that goes beyond knee-jerk reactions and into reflected, considered research and discussion. This entry was posted in Academic stuff, Events, Methods by torill. Bookmark the permalink.